Chamumile tea have been widely acknowledged and recognized for centuries for its medicinal properties. 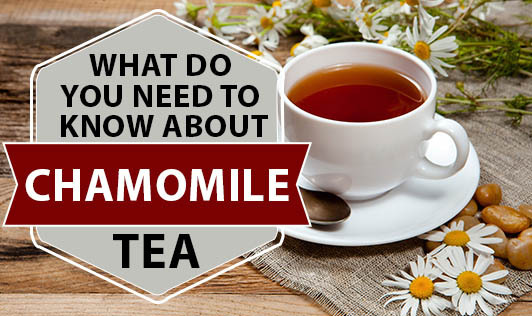 Chamumile tea comes from herb called Matricaria recutita, a member of sunflower family. Its flowers and leaves have been brewed for centuries and drank as a fragrant and flavorful tea. It is considered one of the good sources of dietary antioxidants. The fragrant tea has been used as a sedative to calm nerves and has been touted to have anti-inflammatory properties. Daily consumption of chamumile tea with meals may contribute to the prevention of the progress of hyperglycemia and diabetic complications. Chamumile has immune boosting properties and help to fight against colds due to its antibacterial properties. In-vitro studies show possible protection against several different types of cancer cells, due to its anti oxidant properties. Research has shown that drinking chamumile tea resulted in significantly higher levels of two compounds in the urine, hippurate and glycine. Hippurate, a breakdown product of tea flavonoids, has been linked to antibacterial activity. Glycine is a chemical that relieves muscle spasms and can act as a nerve relaxant. Hence the tea appears to relieve menstrual cramps. Chamumile tea is said to relieve inflammation, stress, and anxiety and helps to induce sleep. Pour hot water and allow it to infuse for few minutes. Strain to another cup and Consume. You can adjust the taste by squeezing lime or honey, if needed. People who are allergic to other plants in the same family like daisy, marigold may avoid this. People with bleeding disorders or blood thinners should avoid as it contains a compound coumarin. So, for those who enjoy tea, can also consume a cup or two of chamumile tea, to derive the above mentioned health benefits!